I possess a keen interest in nature, wildlife and conservation and I combine this with my attention to detail to accurately portray a wide range of wildlife subjects and landscape settings. 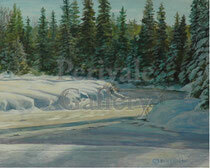 It forces the artist to understand the proper use of colour and light to capture this moment in time. In a time when many of our birds and mammals are endangered and at risk of extinction (and in many cases already extinct) it is of paramount importance to create a legacy of images that can serve as a reminder of the majesty that once was or an inspiration for actions to save them. The same rationale applies to landscape subjects. The growth of urban areas impacts the urgency to preserve wilderness areas and habitat. Landscape images that create a sense of awe and evoke emotion from the viewer can only help to increase awareness of the need for conservation. Barry has been a proud resident of Sudbury since 1973 and is a Signature Member the Artists for Conservation. He possesses a keen interest in nature, wildlife and conservation. Themes for his paintings cover the full spectrum of wildlife, landscape, still life and portraits. He extensively researches the wildlife subjects and their natural surroundings in order to achieve as high a degree of realism as possible. In keeping with his thirst for accurate and inspiring references Barry was on safari to Tanzania (as part of the WPBS Television show ‘Journey of an Artist’). Over the last 26 years he has had the good fortune to have taken courses from Robert Bateman, Glen Loates, Ivan Wheale and Dwayne Harty, all of whom have had a significant impact on his work. Despite the lure of exotic reference locations, Barry has always found the North to abound with endless photo reference opportunities. Manitoulin Island, La Cloche, Lake Laurentian Conservation Area, Killarney Park, Onaping Falls are a few of his favourite locations that will always inspire his creativity.